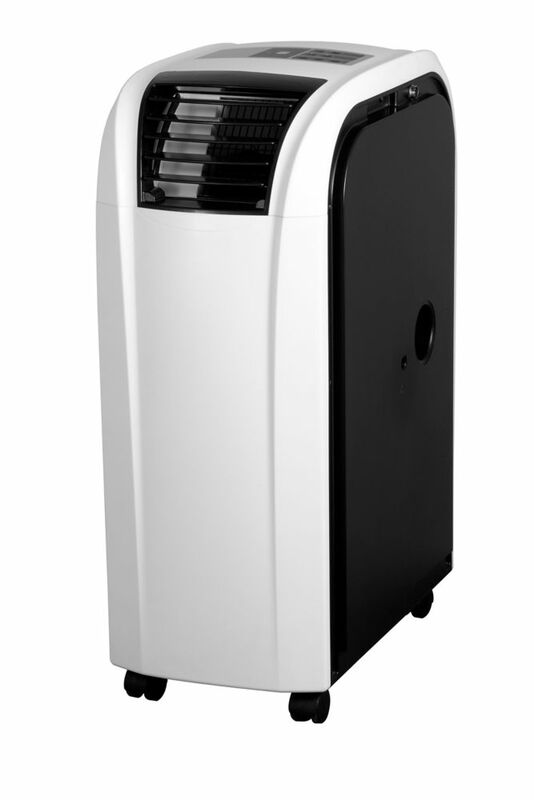 This 12,000BTU portable air conditioner will comfortably cool up to 550 square feet. The unit can be placed outside the residence to vent the cool air inside saving valuable space, and reducing noise levels. Using a full reverse heat pump, the unit can also heat up to 600 square feet, a huge increase over most other models. This model is very well featured including a full function remote control. Full 12,000BTU cools up to 550 sq. ft. more than most other comparable units and heats up to 600 square feet. Full function remote control with LCD display can be used from inside when unit is outside. There's nothing worse than having the hot, heavy air follow you around your home all summer long. The best way to fight it off is with this strikingly-handsome portable air conditioner. It can be quickly and easily installed in any office or room up to 550 square feet in size with the 12,000 BTU cooling capacity keeping the space as cool as possible. The air is circulated evenly around the room with the three-speed fan which can be programmed by an electronic LED display unit as well as by remote. The modern and convenient automatic on/off feature means you don't have to worry about getting up to program it. The R410A refrigerant makes this model an environmentally-friendly option and the unit comes with a direct-drain feature which can handle a capacity of 84 pints every 24 hours. The single-hose design ensures that all the humid air is eliminated from the room and sent outdoors while the reusable air filter makes it simple to keep clean. Lowering the temperature in your home is always a priority once the hot, humid days of summer show up on your doorstep. This can easily be done with this progressive 12,000 BTU air conditioner as it's been made to cool down rooms up to approximately 550 sq ft. in size. This portable model features a single-hose design and its continuous-use, direct-drain system can handle a capacity of 54 pints every 24 hours. It runs quietly and smoothly on environmentally-friendly R410A refrigerant which is designed to keep the air fresh and cool. The variable electronic temperature control with LED display is easy to program and the remote control unit enables you to manipulate the appliance from anywhere in the room. Your personal schedule can easily be adhered to by using the automatic on/off feature to start and stop the unit whenever you choose. Relocating the air conditioner to any room is made easy with the built-in handles and castors. Ecohouzng 8000 BTU Portable Air Conditioner can keep your home cool and dry with single-hose 8,000 BTU air conditioner and dehumidifier. The 8,000 BTUs of cooling power keep a room up to 350 sq. ft. cool and comfortable and the 2-speed cooling and fan and 2-way air direction help spread the air evenly throughout the room. Digital controls offer precise temperature adjustments, and the remote control lets you control the air conditioner from across the room. This air conditioner also features casters that allow for easy movement to the room that needs cooling. The programmable thermostat let you adjust the level of cool for comfort during summer. The dehumidifier can remove moisture from the air to reduce stickiness. Best of all, features like a 24 hour timer, sleep mode and auto mode save energy for efficient and affordable operation. The LG Electronics 10,000 BTU Portable Air Conditioner with Remote features a dehumidifier that removes moisture from the air. It is equipped with casters that allow for easy movement to the spaces that need chilling, this portable AC unit also includes a remote control for easy temperature, fan speed and timer adjustments from across the room. This machine boasts 2-way up/down air deflection that circulates air evenly to eliminate hot spots, providing ample airflow to cool spaces up to 300 sq. ft. Note: the freestanding unit must stay upright for 24 hours before use, must be vented to the outside (window installation kit included with detailed instructions) and cannot be used with extension cords. Portable Air Conditioner This 12,000BTU portable air conditioner will comfortably cool up to 550 square feet. The unit can be placed outside the residence to vent the cool air inside saving valuable space, and reducing noise levels. Using a full reverse heat pump, the unit can also heat up to 600 square feet, a huge increase over most other models. This model is very well featured including a full function remote control.